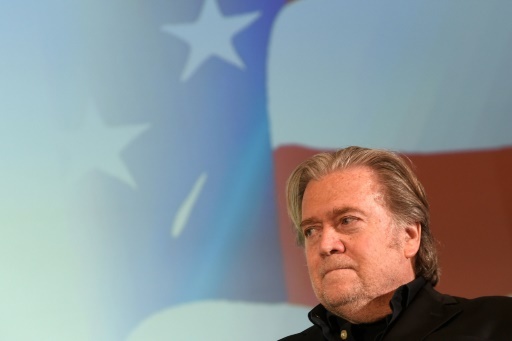 Washington (AFP) – US President Donald Trump’s controversial former advisor Steve Bannon plans to set up a foundation in Europe called “The Movement” to spark a populist rightwing revolt, according to a report. Bannon envisages the organization rivalling George Soros’ Open Foundation, which has given away $32 billion to liberal causes since it was established in 1984, according to the report by the Daily Beast published late Friday. The non-profit will be a central source of polling, advice on messaging, data targeting, and think-tank research. He told the Daily Beat he was convinced the coming years will see an end to decades of European integration. He added he had held talks with right-wing groups across the continent, from Nigel Farage and members of Marine Le Pen’s Front National (recently renamed Rassemblement National) in the West, to Hungary’s Viktor Orban and the Polish populists in the East. The organization will likely be based out of Brussels initially and has set its sights on the 2019 European parliament elections. After new Chief of Staff John Kelly arrived, Bannon’s constant clashes with other advisors became untenable, as did his ties to the extreme right, which drew accusations that Trump fostered racists. Bannon left the White House last August. Featured Photo: AFP/File / Michal Cizek. The architect of Trump’s nationalist-populist campaign and his election victory, White House chief strategist Steve Bannon was nicknamed the Prince of Darkness and the Shadow President.